Redsn0w has been updated to bring jailbreak support for the newly released final version of iOS 4 for iPhone 3G and iPod touch 2G. 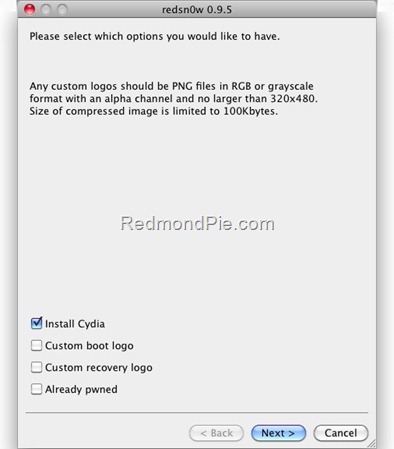 Available for both Windows and Mac, redsn0w jailbreak tool additionally also enables options for multitasking and background wallpapers on iPhone 3G and iPod touch 2G which otherwise are disabled by Apple. Redsn0w beta has been updated to hacktivate iOS 4.0 for iPhone3G (in addition to jailbreaking the iPhone3G and iPod Touch 2G). 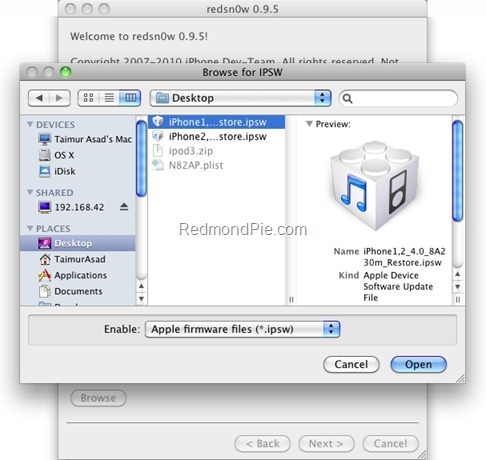 For now, the redsn0w beta release supports only the iPhone3G and iPod Touch 2G at today’s 4.0. It’s still a beta, so you’ll need to let Cydia reorganize, reload, and update after using redsn0w. Step 1: Download iOS 4 (final version) for your version of iPhone and iPod touch. Download links are posted here. 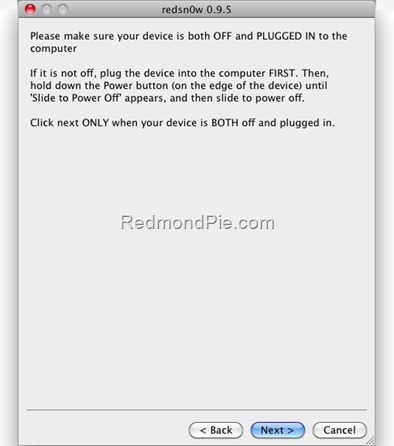 Step 3: Start Redsn0w 0.9.5b5-3 (download link given below) and point it to the original iOS 4 firmware file to proceed. If you notice a blank white icon for Cydia with no sources. Go to the Sources panel and add http://apt.saurik.com/cydia-3.7 repo. Now restart your phone and you should see the regular standard Cydia logo with all the sources now. Follow the complete step by step guide posted here to unlock iPhone 3G, on iOS 4, on any baseband using Ultrasn0w 0.93. UPDATE 1: Alternatively, Windows users can now use Sn0wbreeze 1.6.1 for 4.0 to jailbreak iPhone 3GS, 3G and iPod touch 2G by creating custom firmware files on Windows. Step by step guide can be found here. this worked for me using a macbook and 2g NON MC ipod touch. Redsn0w doesn't recognize the IPSW. is there something I'm supposed to do that I'm missing on? okayy ii downloadedd thee firmware restoree andd run andd extractt redsnow,. but whenn ii look for the restore file ii downloadedd,. itt sayys unablee to recognizee ipsw or somethingg,. ii gott thee filee rightt from this sitee,. ckann ii gett somee helpp pls?.. After updated to firmware recommended and start redsn0w it says unable to recognize specified IPSW. Help please!!!!! The step i followed not work for me, cos redsn0w doesn't recorgnize IPSW, could you help me pls! Just followed all instructions for OS4 ipod touch 2G and it failed to start back up. Software says waiting for reboot for over 30 minutes. Ok maybe I jump the gun. even though the device appeared dead, I restarted the process, step by step and it took. Looking good so far. Worked perfectly for me on an MB model iPod Touch 2G. THANKS! took a while, but it works! didnt work on my MC model =[ now wat? I followed this about a month ago and it worked great. Would love to know how to upgrade now. Do I restore it, upgrade, then jailbreak/unlock again? I will probably wait until 4.1, as that seems to be the consensus from what I have read. Tried this and my ipod wont turn on. it sat at the “waiting for reboot” screen for about 20 minutes. So i clicked cancel because nothing was happening. and now my ipod touch 2g isnt responding and wont even go into dfu mode. It just shows blank black screen. Also my computer cant recognize it either. shoud i jailbreak my ipod with this becuz ther is alot of negative replies about jailbreaking and i dont wana break my ipod ? it worked, im so glad!!!!!!!!!!!!!!!!!!!!!!!!! Thx so much guys, btw if it didnt work u didnt do proply. THX SO MUCH IT WORKED xD!!! was this ipod touch MC model and on wondows?????? goto Tools -> Folder options -> vew -> check “show hidden files and folders”. next navigate to your software updates folder. All done! Works perfectly on my 3G. THX for your work!!!! does this wipe all your music off your ipod when you do this process? ”waiting for reboot” what is this ? Uhm I ALMOST got it… until the LAST step.. My screen turned black >.< and Ive tried continously working on the last step. But nothing happens. BTW I have the itouch 2G 8GIG… Help please? Why wont it reboot? Ive waited 5+ minutes.